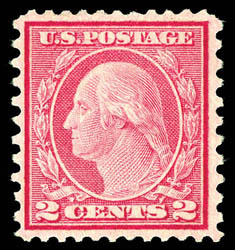 1919, 2¢ carmine rose, type II, rotary coil waste, o.g., very lightly hinged, fresh with strong brilliant color, exceptional centering for this notoriously off-centered issue, Very Fine and choice; with 2015 P.F. Graded certificate (VF 80, SSV $5,650). Scott No. 539 $2,700 for the grade of fine. A REMARKABLE MINT EXAMPLE OF THE 1919 2¢ CARMINE ROSE TYPE II ROTARY COIL WASTE ISSUE. 1923, 12¢ brown violet, o.g., never hinged, perfect centering within uncommonly large and evenly balanced margins, rich deep color and crisp impression on bright fresh paper, a Superb jumbo gem, a phenomenal gem stamp; with 2015 P.S.E. Graded certificate (Gem 100J, SMQ $650 for only 100). 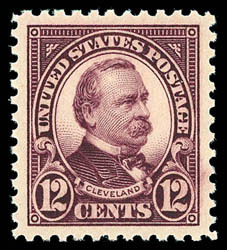 THE ONLY NEVER HINGED EXAMPLE OF THE 1923 12¢ CLEVELAND ISSUE RECEIVING THIS ULTIMATE P.S.E. GRADE. 1922, 50¢ lilac, o.g., never hinged, remarkable centering amid uncommonly large evenly balanced margins all around, deep bright color and very fresh, a Superb jumbo; with 2015 P.S.E. Graded certificate (Superb 98J, SMQ $900 for only 98). 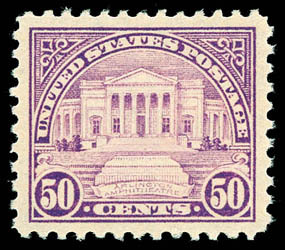 A OUTSTANDING LARGE MARGIN NEVER HINGED EXAMPLE OF THE 1922 50¢ ARLINGTON AMPHITHEATER ISSUE. 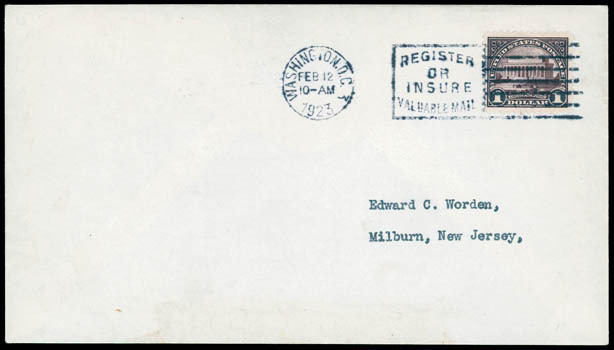 1923, $1 violet black, deep color and wide margins, tied by "Washington D.C., Feb 12, 1923" First Day of Issue slogan machine cancel on fresh Worden cover to Milburn, N.J., Extremely Fine. AN EXCEPTIONAL AND VERY RARE FIRST DAY COVER USAGE OF THE $1 LINCOLN MEMORIAL ISSUE. 1923, 2¢ carmine coil, type I, well centered, tied by 1934 Springfield, Mass. 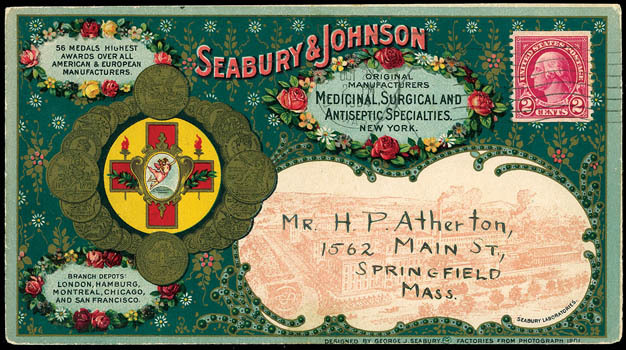 machine postmark on cover with Seabury & Johnson multicolored allover illustrated floral design showing Factory View and Medallion Frame and Logo, reverse with illustrated ad for Benson's Plasters showing Men & Women Wearing Product, Extremely Fine and choice. Scott No. 599 Estimate $750 - 1,000. A SUPERB EXAMPLE OF ONE OF THE RAREST SEABURY & JOHNSON ADVERTISING DESIGNS. 1925, 17¢ black, o.g., never hinged, rich color and Post Office fresh, precision centering with large beautifully balanced margins around, a Superb gem, with only six examples to grade as such with only one higher; with 2015 P.S.E. Graded certificate (Gem 100). 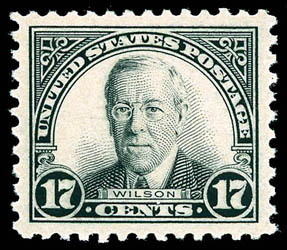 AMONG THE FINEST MINT EXAMPLES OF THE 1925 17¢ WILSON ISSUE IN EXISTENCE. 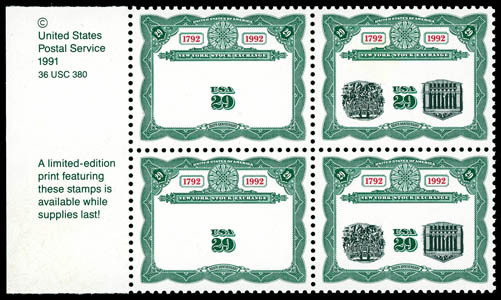 1992, 29¢ N.Y. Stock Exchange, center inverted se-tenant with center omitted error, horizontal left margin block of four, post office fresh with pristine never hinged original gum, Extremely Fine. Scott No. 2630d; $45,000 Estimate $30,000 - 40,000. ONE OF ONLY TWO RECORDED SE-TENANT INVERT ERROR NEW YORK STOCK EXCHANGE BLOCKS OF FOUR. There are 56 examples of this invert error recorded, 28 in each of the two panes of 40. The other 24 stamps having their centers omitted. There are only 10 possible se-tenant pairs contained in the two sheets, and only one sheet has been broken up into singles, se-tenant pairs and blocks of four.